Twelve years ago the small town of Coventry, Massachusetts was in the grasp of a particularly brutal winter. And then came the Great Storm. It hit hard. Not everyone saw the spring. Today the families, friends and lovers of the victims are still haunted by the ghosts of those they lost so suddenly. If only they could see them one more time, hold them close, tell them they love them. It was the deadliest winter in living memory. When a new storm strikes, it doesn’t just bring snow and ice, it brings the people of Coventry exactly what they’ve been wishing for. And the realisation their nightmare is only beginning. I had previously read the authors novel Ararat, which absolutely blew me away and has recently won a book an award! 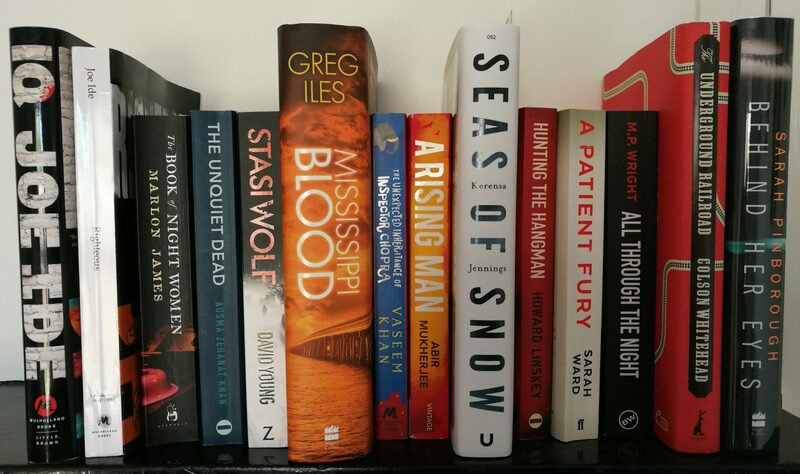 When we had the snow (March 2018 UK), I decided to read a novel with a theme of a storm/blizzard and picked up Snow Blind from my tbr pile. The novel has an eerie horror/mystery feel and has received praise from Stephen King! So, here’s my thoughts on Snow Blind. The snow is set in the small town of Coventry, Massachusetts during a brutal winter. My favourite thing about the novel is the character depth. The characters are detailed, but not overly so. Just enough to get you invested in their stories and intrigued on their journey within the novel. The novel opens with restaurant opener Ella having a cigarette break alone as the snow falls. Ella is lonely and vulnerable as the blizzard moves in. Allie is a young widow, a mum to two young boys and currently dating handsome doctor Niko. They gather as a family to watch movies and eat popcorn, whilst the storm hits Coventry. Allie’s husband died in combat and she is apprehensive about her new relationship with Niko. How her sons Isaac and Jake will adapt to the new situation, and also Niko’s daughter Miri. They read incredibly well as a family just trying to survive what life throws at them. But their pain is far from over! Joe Keenan is a rookie cop for the Coventry PD. He is on patrol during the blizzard, dealing with the typical complaints and thinking back to the last aggressive storm of 1978. When Joe hits something in his patrol car, something he can’t see. . .
Doug Manning is a local mechanic on route to an evening with his workmates to watch the game. His wife Cherie remains at home awaiting his return. When some ‘jokes’ get out of hand, Doug finds himself fired and cast out from his workplace. TJ Farrelly is a local singer at Ella’s restaurant, he harbours romantic feelings towards her but has previously held back. He is supposed to be spending the evening of the storm with his elderly mother Martha. But when there’s a power cut in Ella’s restaurant he can’t resist the urge to bring her comfort. Cherie (Doug’s Wife) is alone at home on the telephone with her best friend Angela. When her dog begins howling she must venture into the yard during the storm to bring him in. She hears strange whisperings of ‘Let’s get in’ and her dog bites her hand. The night is full of strange occurrences for the townsfolk of Coventry. The evening continues to get more and more creepy. Joe is dealing with the 13 power lines that are down, when he is summoned to the Wexler’s residence The Wexler son and his two friends have gone missing. Joe must find the teens as the snow continues to fall down around him. Allie and Niko discuss their future, trying their best to consider everyone in the family’s feelings and where they go from here. Down the hall in the boy’s room, Isaac has become terrified of a presence outside of the window ‘There are monsters in the yard’. Despite the comforting words of his brother Jake, he opens the window. A mistake that will scar them all, one way or another. At this point the novel has a huge twist and it is not one I am willing to give away. What I have described above is actually, only a short part of the opening of the novel. The beauty of this novel is within the first twist! This novel has a subtle eerie feeling and is perfect to read when the snow is falling. As stated above the descriptions of the characters are brilliant. They draw you into their individual stories and they are all unique. The novel maybe of the horror genre, but it does have a strong emotional edge also. The theme of personal grief and emotional longing for a lost relative, is beautifully written. When you add in the eerie feeling and the flash horror scenes, you have the recipe for a 5* novel. Enjoy the snow. . . . . Previous Previous post: Anne Bonny #BlogTour #BookReview and #QandA The Tin God by @ChrisNickson2 5* #HistoricalFiction #NewRelease @severnhouse #AnnabelleHarper #WomensRights #ThePoorLaw #Leeds Folk music, feminism and fire. . . .
Next Next post: Anne Bonny #BlogTour #GuestPost & #Extract Can’t Get You Out Of My Head by @thatsueshepherd #NewRelease @CorazonBooks Sisters, secrets and second chances. . . .